It can’t be easy opening a restaurant practically next door to Andy Ricker’s Pok Pok Ny, where the crowds and the no-reservations wait could make a DMV clerk blush. A restaurateur needs to fill seats, after all, and right over there, within Vietnamese-chicken-wing-tossing distance, those desperate huddled unfed masses are just milling about … waiting. Such is the fate of Chió, a perfectly nice Italian restaurant that flung open its doors last month in Brooklyn’s so-called Columbia Street ­Waterfront District. There is, however, an upside to this type of arrangement. Viewed from the perspective of an optimist, here is opportunity knocking. Sooner or later, some of those would-be Pok Pok customers are bound to end up cooling their heels at your bar until they are summoned away by text message or the chirping of their cell phones, right? And who knows? They may even grow weary or distracted and order some food. But Chió (pronounced kee-OH) is worthy of consideration on its own merits and not as a booby-prize backup plan for those who fail to get into the hot spot down the block. The welcome is warm and the mood is mellow. The service is of the eager-to-please but mostly unobtrusive variety. The tavernesque space is done up in the faux-rustic style of the day: reclaimed wood, some bench seating, light fixtures fashioned from Mason jars. And the fireplace-equipped barroom leads past the kitchen to a dining room and beyond that to a peaceful outdoor patio. Chió’s well-traveled chef is Alex McWilliams, who did time at Craft and Paul Newman’s ­Dressing Room in Westport, Connecticut. Here, he’s cooking what the restaurant would like you to think of as “protein light” regional Italian cuisine. If that description fails to rouse the appetite, know that all it means is that the kitchen does not do secondi courses, and that the menu more or less follows the format of Mario Batali’s much-emulated Otto Enoteca Pizzeria: It’s pasta, pizza, salads, and veggie-centric appetizers. There’s also salumi, and when you spot salumi on a menu, formaggi cannot be far behind. Which is not to say that the kitchen doesn’t pitch curve balls. Consider, for instance, the pizza, which takes as its base a flatbread similar to the one known among Sardinian shepherds as pane carasau. Another is the use of grano arso (burnt grain) in the dough, which gives this bread its dark color and putatively smoky flavor. The result is a superthin, crunchy crust topped (too heavily) with all sorts of delicious combos like provolone, hot peppers, and crushed tomatoes. Neapolitans and puffy-dough aficionados might not go for this pie, but your average Sardinian shepherd would probably wolf it down and ask for seconds. Among the starters, or stuzzichini, we like the roasted carrots with fregola, and some decidedly non-protein-light chunks of swordfish swaddled with speck and plopped down atop a hill of shell beans. More of that grano arso turns up in the cavatelli with broccoli rabe and hot Italian sausage, one of the restaurant’s best pastas. Another good one is bucatini cooked firm and judiciously mingled with bottarga, roasted cauliflower, and rye-bread crumbs. The potato gnocchi and spaghettini all’ amatriciana (why limp spaghettini instead of classic bucatini?) don’t fare quite as well, both victims of watery tomato sauces. But there’s a good goat’s-milk cheesecake for dessert, and a special of caramelized figs with a heap of mascarpone. At this early, undiscovered stage in Chió’s existence, you can linger over both to end a leisurely meal that lasts as long as it might take to score a table a few doors down. The Columbia Street Waterfront District peters out at Atlantic Avenue, as does Columbia Street itself. But if you cross the thoroughfare and cut through Palmetto Playground, you’ll wind up on Columbia Place. That’s where you’ll find Iris Cafe, a popular coffee-and-sandwich spot that recently obtained a wine-and-beer license, the crucial prerequisite to launching dinner service. Though still under the radar, the evening menu at Iris is a boon for locals looking for a casual, homestyle dinner cooked with a distinctive Slow Food-­locavore approach. As fans of the café’s sticky buns and ­country-ham sandwiches can attest, Iris does not aspire to serve “health food,” and its six-­apps, four-mains menu at first glance comes off as unalloyed Americana. But if Iris has a hidden agenda, not unlike Chió’s grano arso fetish, it’s to sneak in whole grains and white-flour alternatives whenever possible: The chewy toasts spread with smoked-trout pâté are actually Finnish Ruis, the high-­fiber, low-glycemic-index Queens-baked rye, and the Dutch baby pancake that accompanies a string-tied parchment “parcel” of wild mushrooms is made from buckwheat. Because it’s impossible to escape kale salad, especially in Brooklyn, Iris serves it as a special, and boiled bok choy, carrots, and squash make a salubrious starter plate with caper-mayo dip. Among the entrées, you’ll find rosy pink, herb-infused shavings of leg of lamb, garnished with millet, the grain you probably haven’t thought about since your collegiate Moosewood Cookbook phase, and fish en papillote, a cooking technique dictated as much by logistics as by taste: The ventless electric kitchen precludes frying, sautéing, or any other method that could result in billowing smoke or lingering odors. Though there is a tendency toward overcooking (especially with the roast chicken, which comes with a nutty spelt pappardelle), a moist meatloaf special is crisp-edged, leavened with Finnish Ruis crumbs. For dessert, we recommend the lemon posset, or eggless custard, over the chocolate cake—not just because the former is light and cool and served with crunchy buckwheat-poppyseed cookies, but because the latter’s secret ingredient (avocado) adds relatively little in terms of texture or flavor. 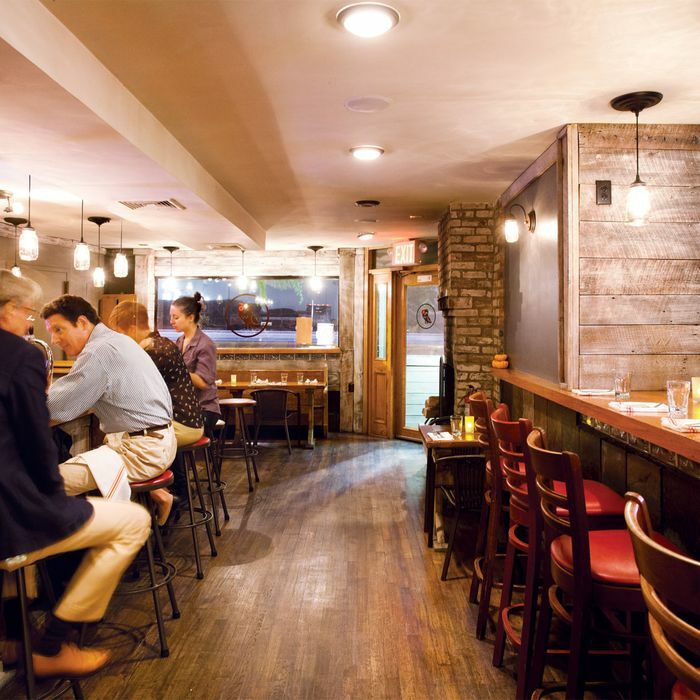 But these quibbles are nullified by the tranquil setting, recently reconfigured to accommodate a bar serving a handful of wines, regional ciders, and local beer and kombucha on tap (naturally). It might not yet be on every fare-seeking taxi driver’s radar, which is probably just how the locals like it. Hours: Sunday and Tuesday through Thursday 5 to 10 p.m., Friday and Saturday till 11 p.m. Ideal Meal: Roasted carrots, bucatini with cauliflower, figs with mascarpone. Note: Red wine by the glass is served too warm; better to go with white or beer. Scratchpad: One star for satisfying Italian cooking, another for the comfortable space and friendly atmosphere. Hours: Dinner 5:30 to 10 p.m. Ideal Meal: Wild-mushroom parcel with buckwheat Dutch baby, meatloaf, and honey-lemon posset. Note: The café has recently spawned Iris Take Away up the block, a glorified bodega stocking everything from Handsome coffee to salmon jerky. Scratchpad: The new dinner menu is a godsend for the gluten-averse, but varied and enticing enough for everyone else. *This article originally appeared in the October 1, 2012 issue of New York Magazine.